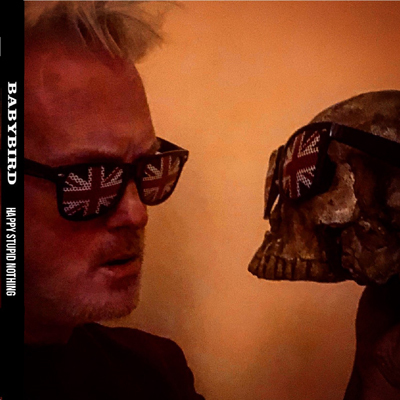 Alternative music legend Babybird releases a new album ‘Happy Stupid Nothing’, on March 1 via Psycho Mafia Recordings. Described as “a dazzling collection of songs that will surprise many”, it’s the first Babybird material in eight years to be released via any label. Lead single ‘King Of Nothing’ is available as a free download. The first “proper” Babybird LP ‘Ugly Beautiful’ contained full-band versions of songs Jones had previously recorded as demos on the self-released albums. It went Gold and spawned four Top 40 hits, one of them being the omnipresent mega-smash ‘You’re Gorgeous’, which went to number 3, staying in the charts for 19 weeks. The casual pop consumers were probably taken aback when they heard the rest of ‘Ugly Beautiful’, where the big hit was placed alongside frightening songs about death and religion, dark lo-fi moments, as well as some more melodic tracks. There was also the cacophonous, insane ‘King Bing’, Jones’s nine minute “no thanks” to the music industry and pop stardom. Those who were paying attention soon learned that there was a lot more to Babybird. A few years later in 1998, they re-emerged with the darker ‘There’s Something Going On’, an extraordinary record that delivered another three UK chart entries, including the startling ‘Bad Old Man’, ‘If You’ll Be Mine’ and the wonderful ‘Back Together’. The album was received well by critics and entered the UK Top 40. The follow-up ‘Bugged’ featured another Top 40 single, ‘The F Word’, which went on to be used as the theme tune to Gordon Ramsey’s TV series of the same name. Babybird split in 2000 after departing from their record label, with Stephen Jones turning to making sinister hip hop with Death Of The Neighbourhood, and crafting his own solo record ‘Almost Cured Of Sadness’ in 2003. However, a few years later in 2006, Babybird returned with the 2006 album ‘Between My Ears There’s Nothing But Music’. Compiled and curated by indie label Psycho Mafia Recordings, ‘Happy Sad Nothing’ is a collection of songs on a par with the very best Babybird records, and represents a new creative peak for this unique, restless and distinctive musician. Many of these songs slipped under the radar or became lost in the vast archive of music that Jones has published online. Here, they are proudly and deservedly on display. A limited edition gatefold CD is available to pre-order at http://psychomafia.bandcamp.com/album/happy-stupid-nothing-2 Babybird are currently on tour with Dodgy, playing in venues around the UK during February and March.